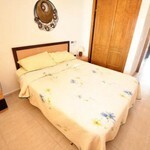 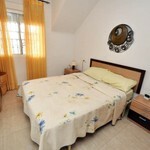 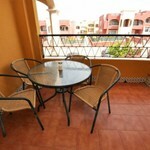 This apartment on the popular Dream Hills II urbanisation is available for short and long-term rentals. 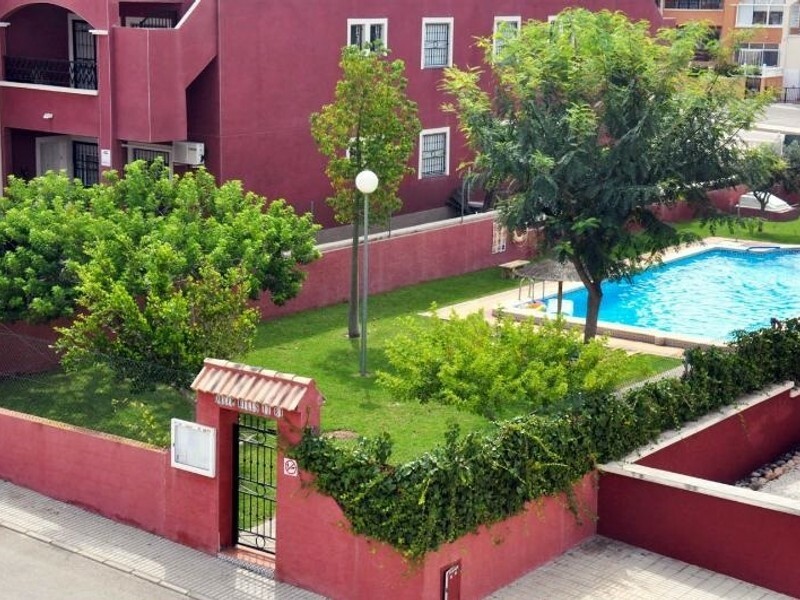 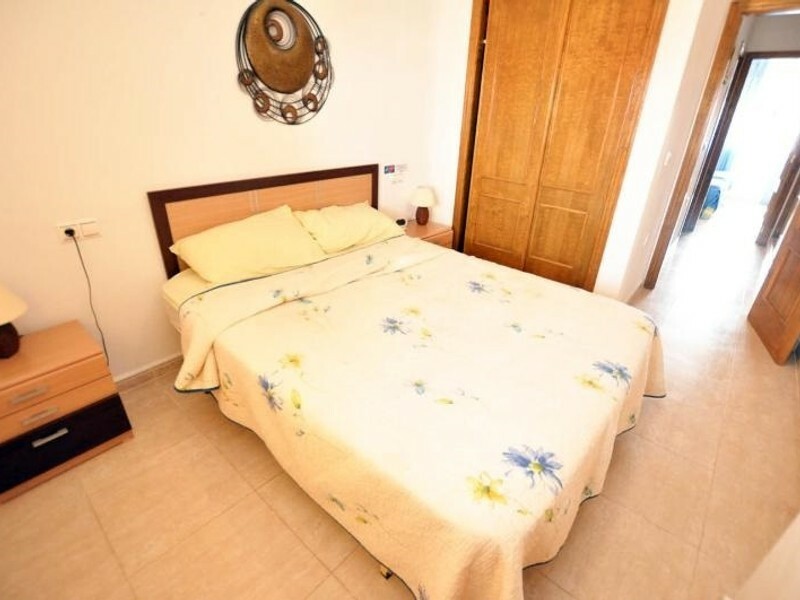 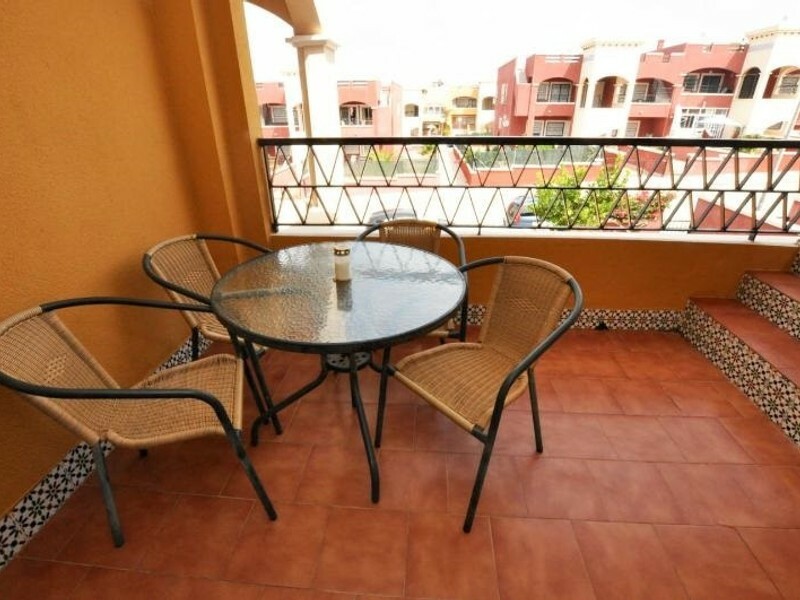 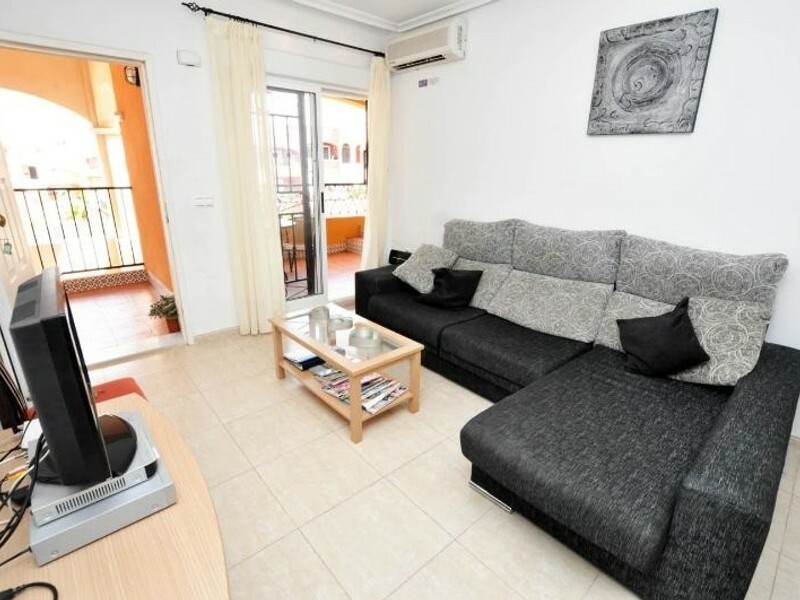 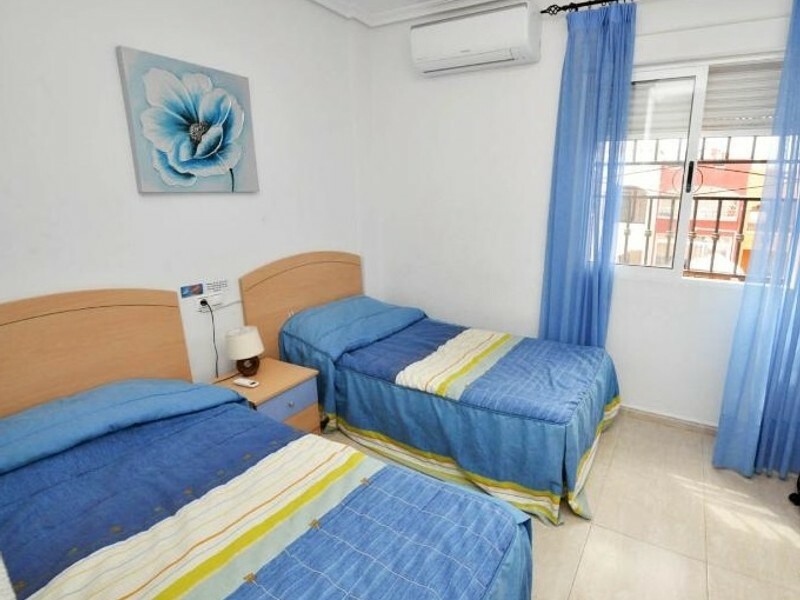 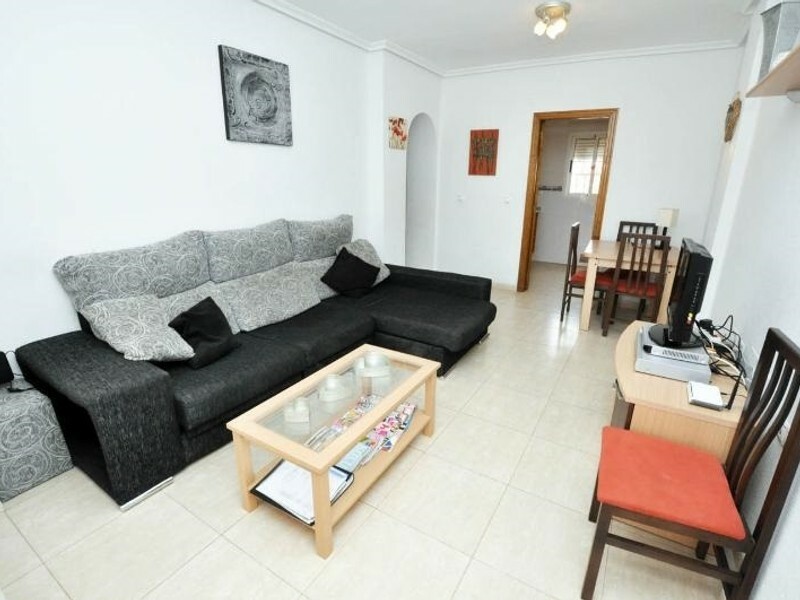 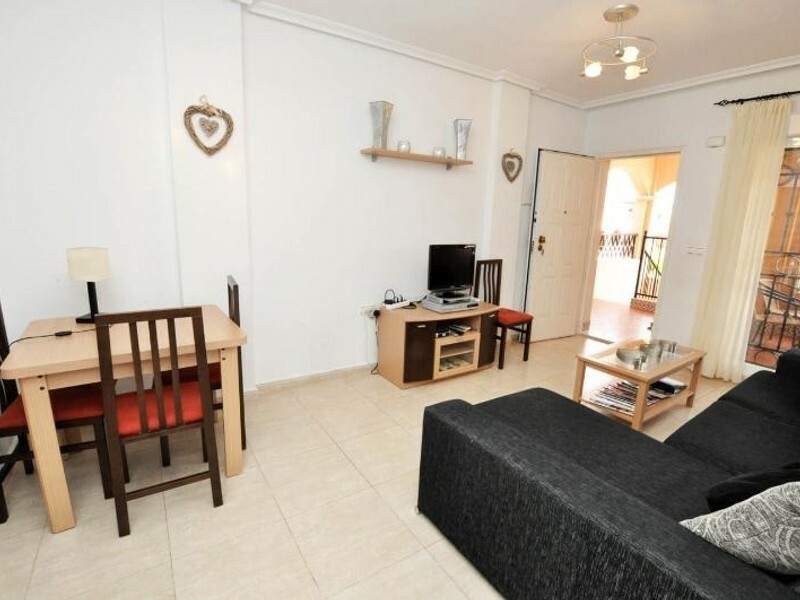 Whether you want a holiday in the lovely Southern Costa Blanca, are visiting friends / family in the area or you require a base for work, this well-equipped, modern, enhanced apartment in an excellent location will serve you well. 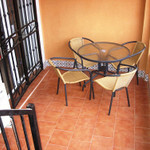 Free Wi Fi is available. 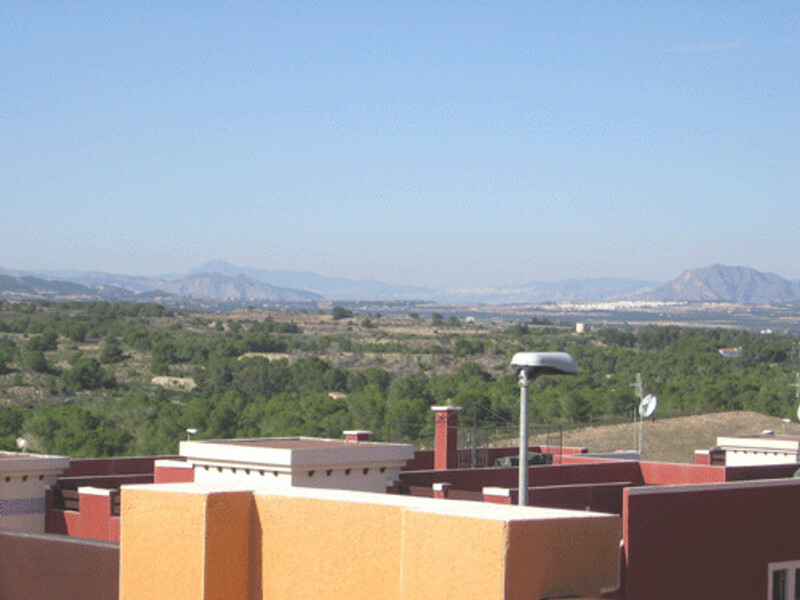 This upper floor apartment is based on a modern development and offers excellent mountain views. 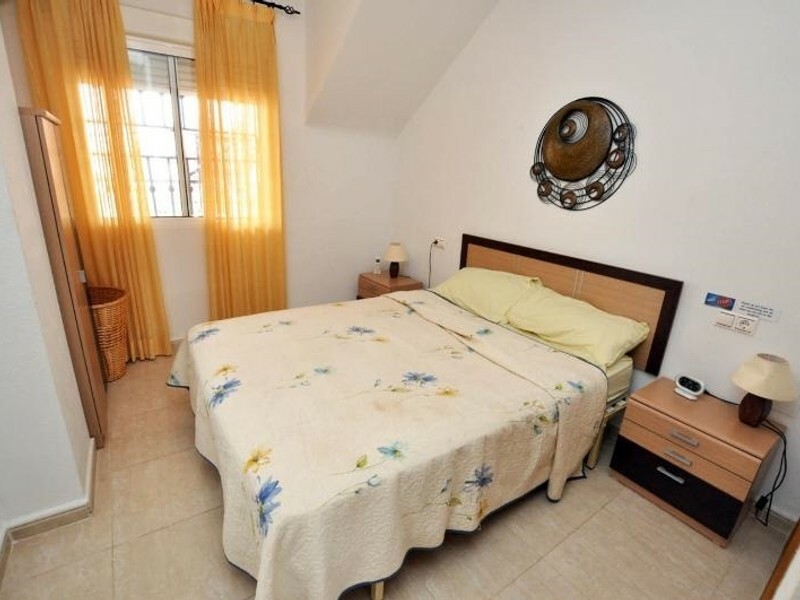 You will enjoy decor and furniture that is contemporary and comfortable and have use of a full range of appliances.The apartment has two bedrooms (one double, one twin) with built-in wardrobe space provided in each. 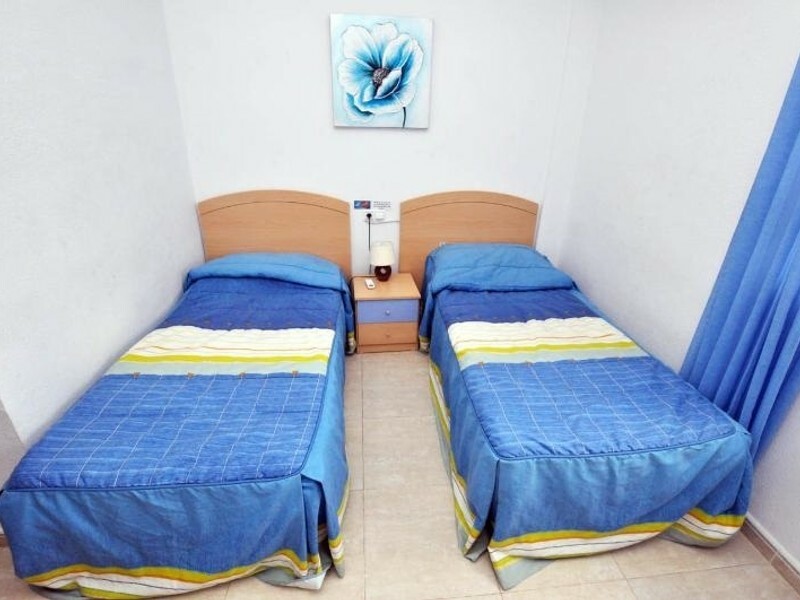 As a guide we recommend a maximum group size of 5 adults with a full size additional z bed available. 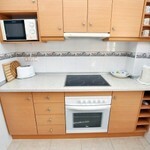 We can supply a cot. 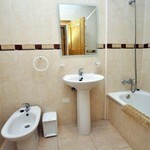 The apartment also benefits from having two bathrooms adjacent to the bedrooms. 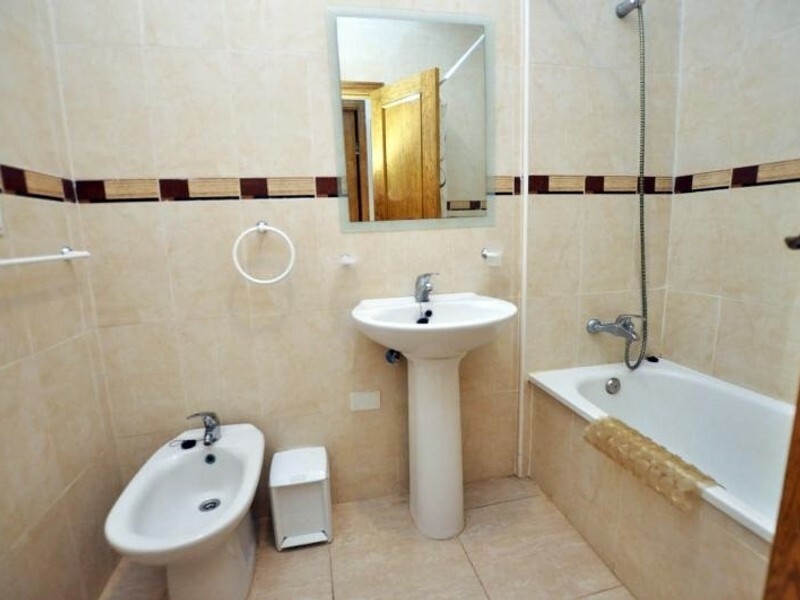 The 2nd bathroom is of particular benefit if your group is on the larger size. 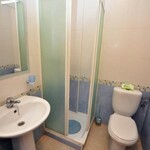 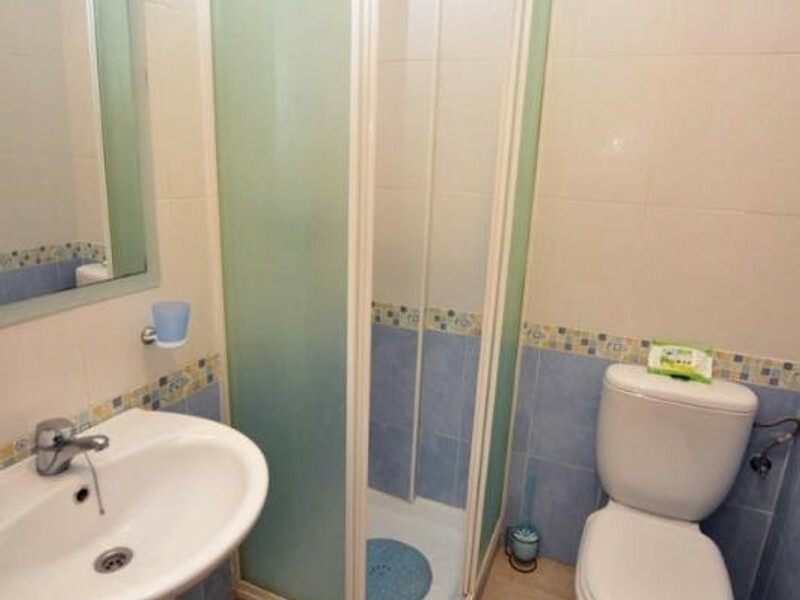 Both have a WC and wash basin with one having a bath / shower, the other a shower unit. 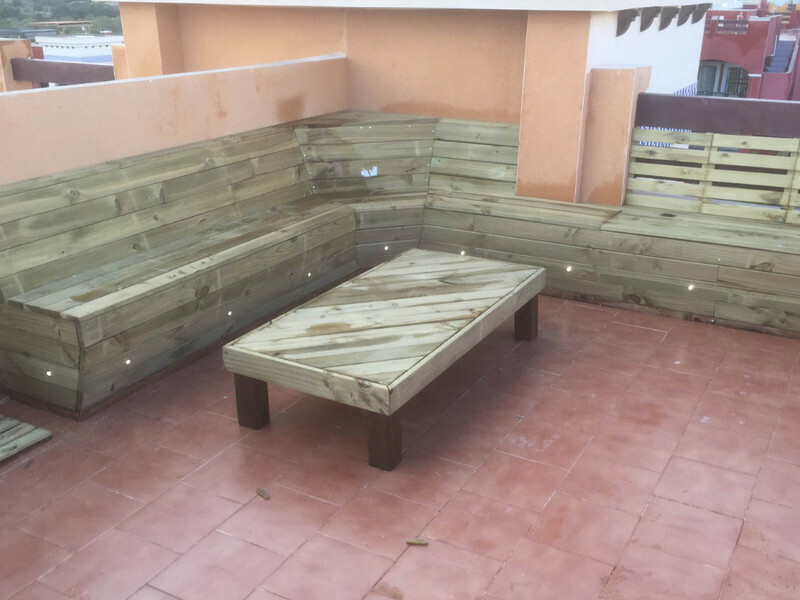 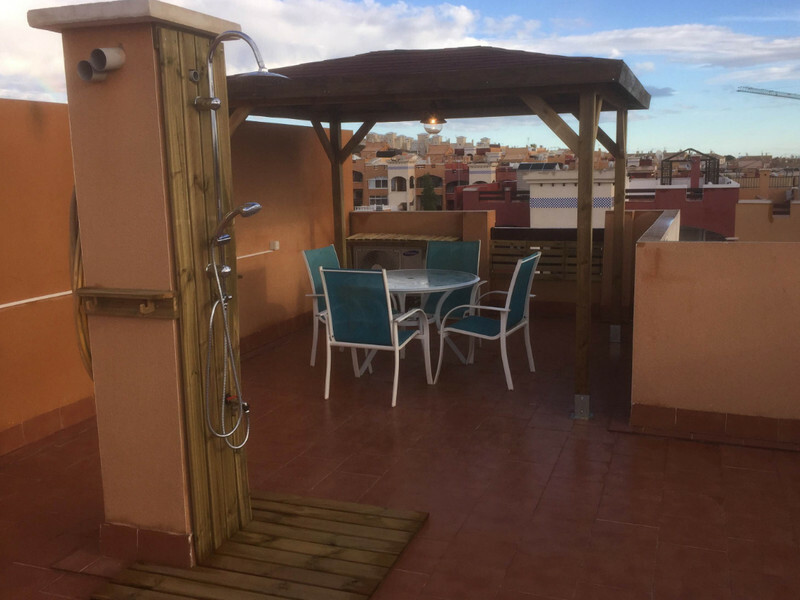 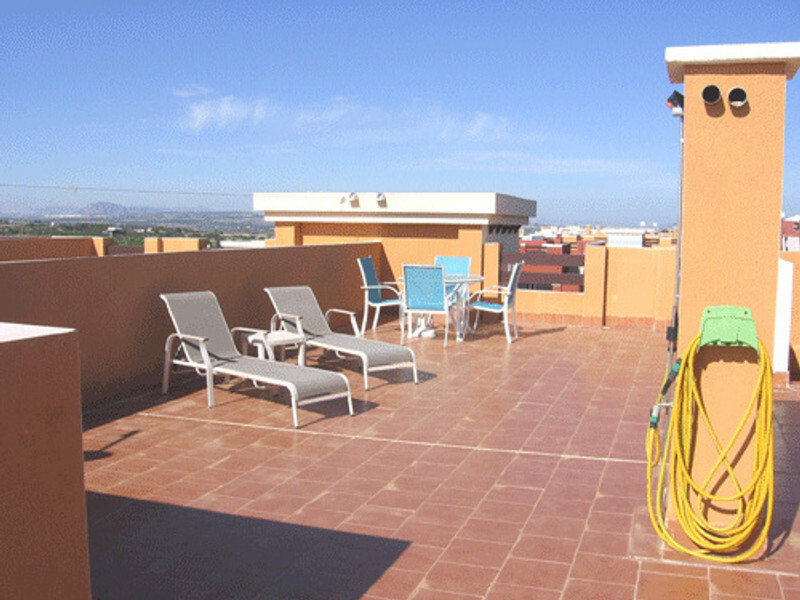 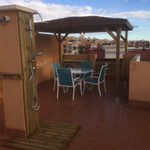 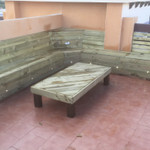 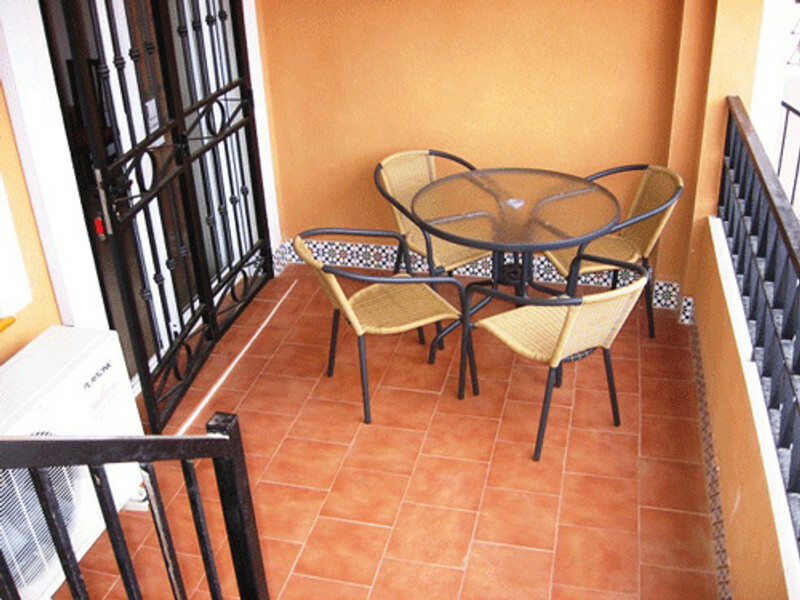 We also offer a 'beach' shower on the roof solarium for those that want to cool off on the hot summer sunbathing days with a shower.There is also added built in seats with under lighting and a pergoda shading the table and chairs to sit and admire the excellent views of the mountains and the pretty town or Orihuela. 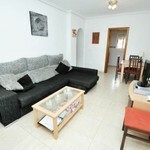 The living room is served by comfortable seating, a dining table and a TV with a DVD / Video player. 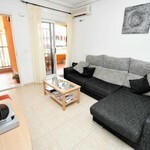 Free Wi FI and British TV with up to 70 channels, including the likes of ITV, BBC and Channel 4. 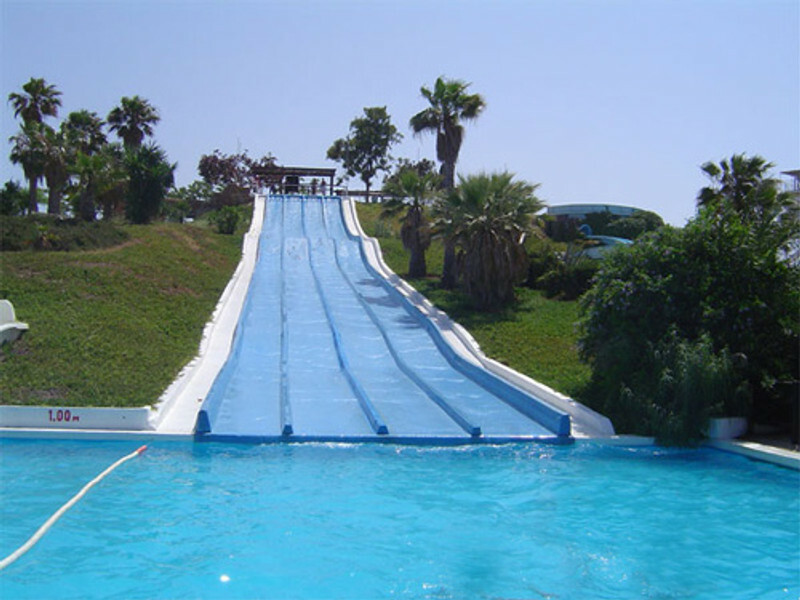 We have supplied wide array of films to suit all ages although you are also welcome to bring your favourites with you from home. 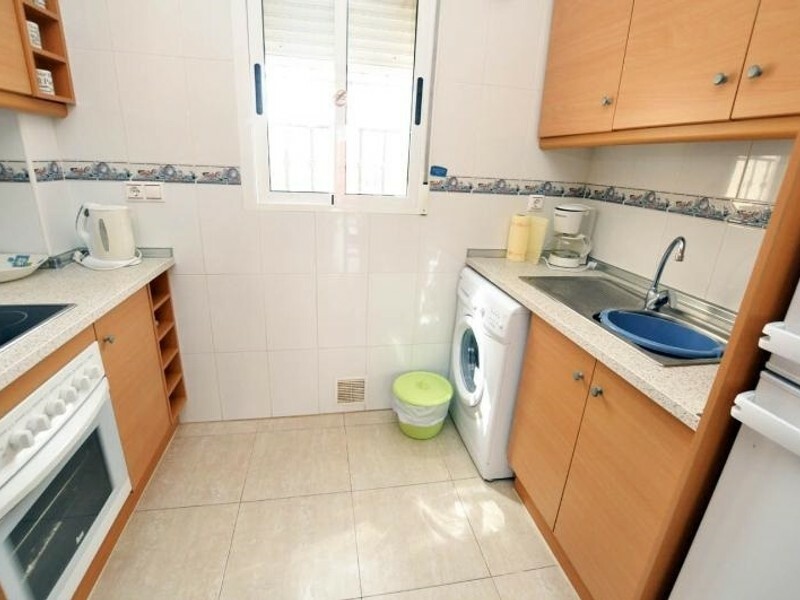 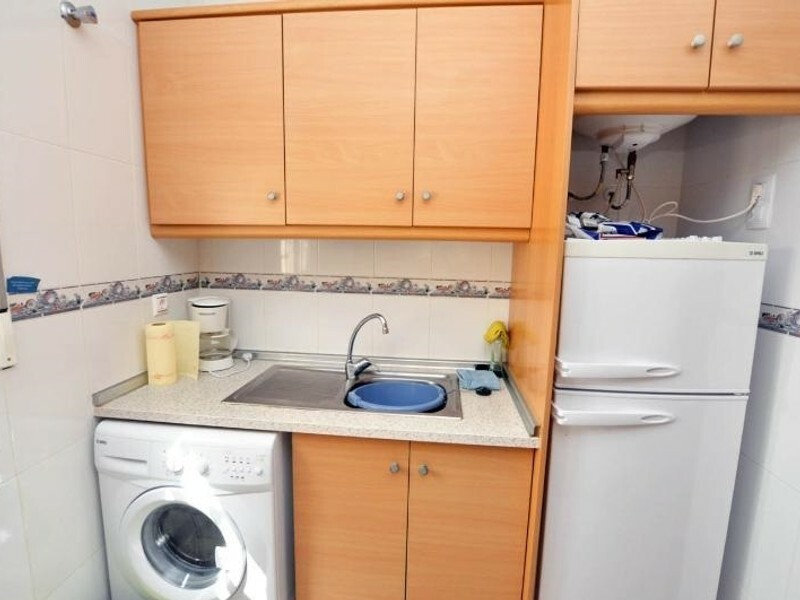 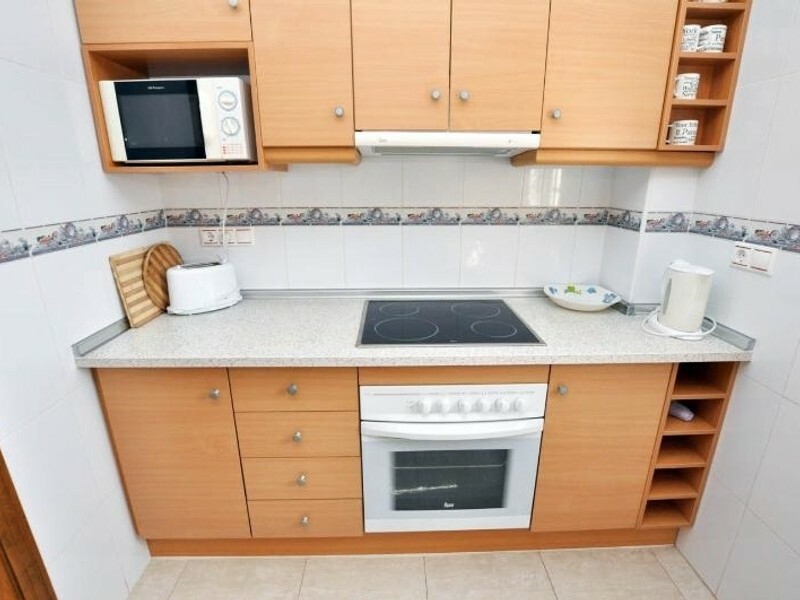 The kitchen has all the appliances you expect to find (cooker, fridge freezer, microwave and washing machine) and most of the utensils you would find in your own kitchen – though you may not intend to do much cooking whilst on holiday, it is nice to have the option if you so wish. 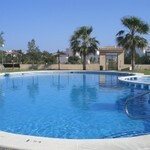 A safe is provided for your most valuable items such as passports and money. 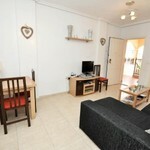 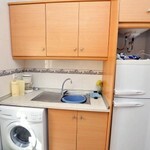 Also for your comfort air conditioning units have been installed in the living room and each of the bedrooms. 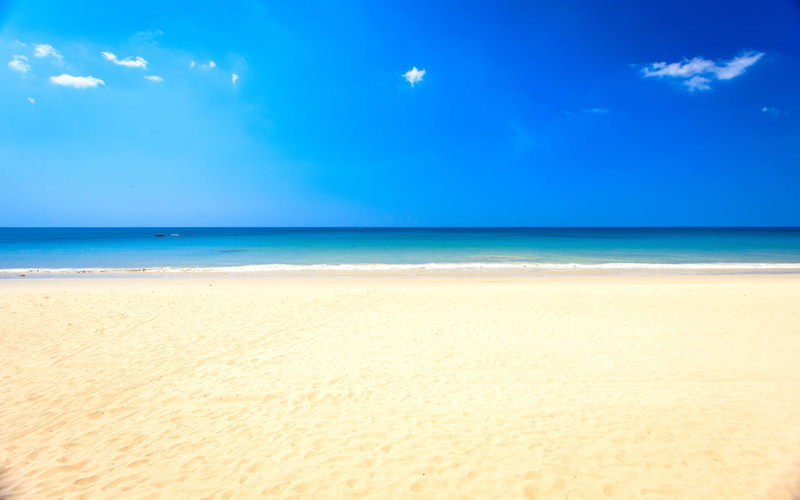 This will be particularly valuable for those who stop May-Sept when air con is a necessity. 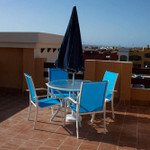 They also provide heat which will come in handy for guests who visit at cooler times of year. 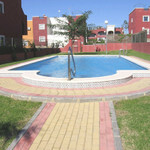 There are via park 3 and 4 commercial centres both within 10 mins walk. 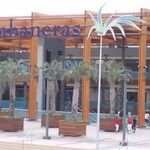 Both have restaurants and bars , a mixture of English, Chinese, Indian and others. 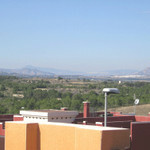 There is also an Aldi supermarket 5 mins walk away for supplies and a bus service around the corner. 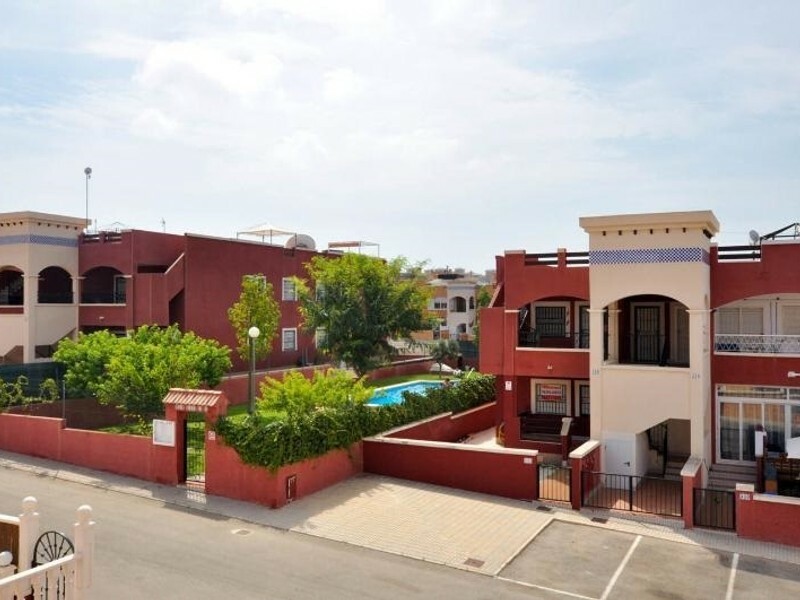 Located 10 mins south of Torrevieja, it is well appointed for areas such as Punta Prima, Villamartin, Playa Flamenca, Los Balcones and Cabo Roig. 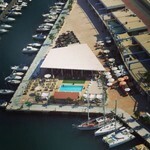 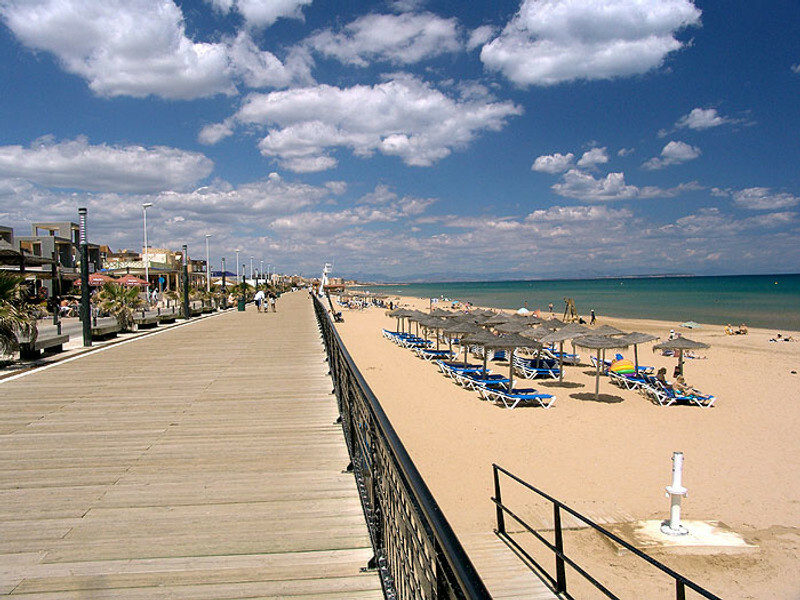 Several beaches are just a few minutes away by car. 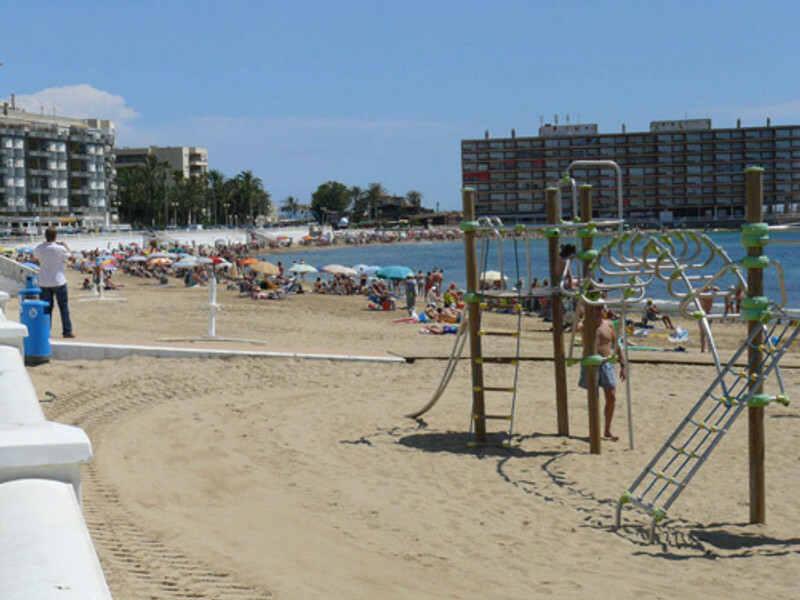 Alternatively, the area is well-served by buses and taxis. 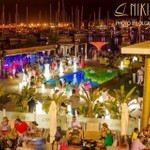 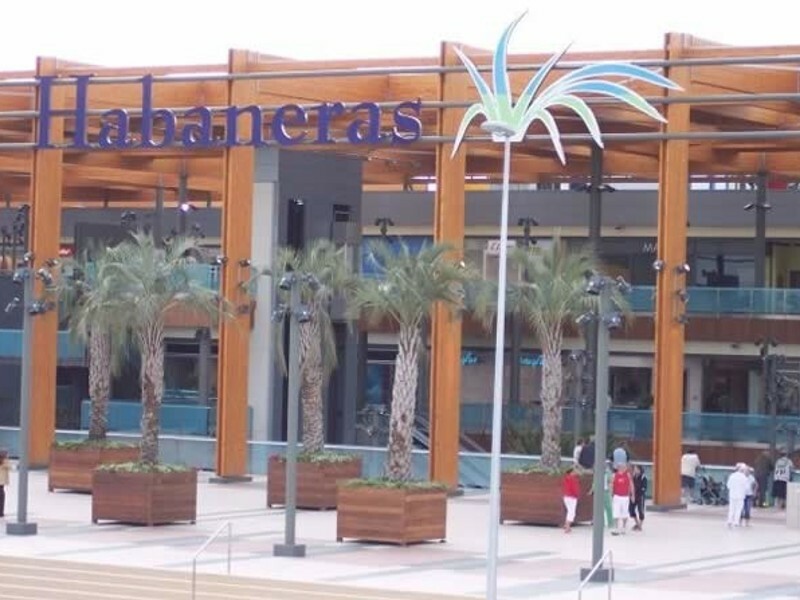 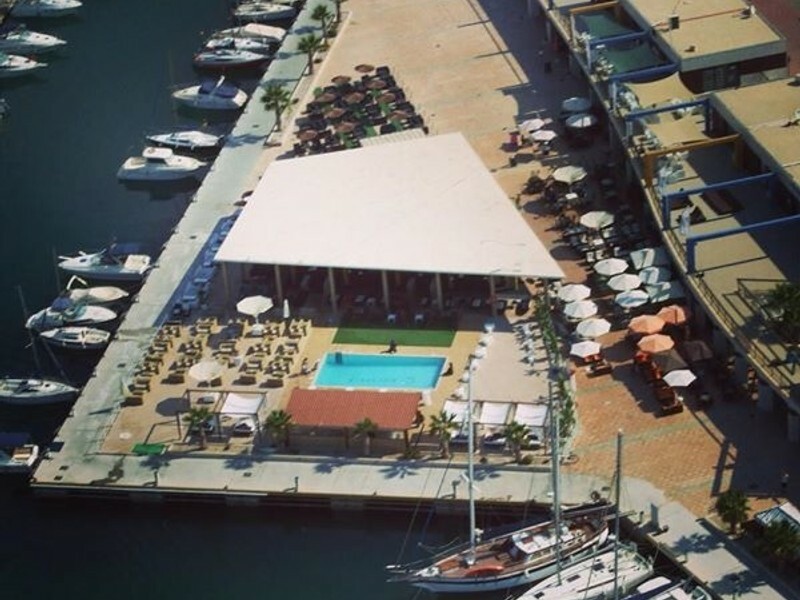 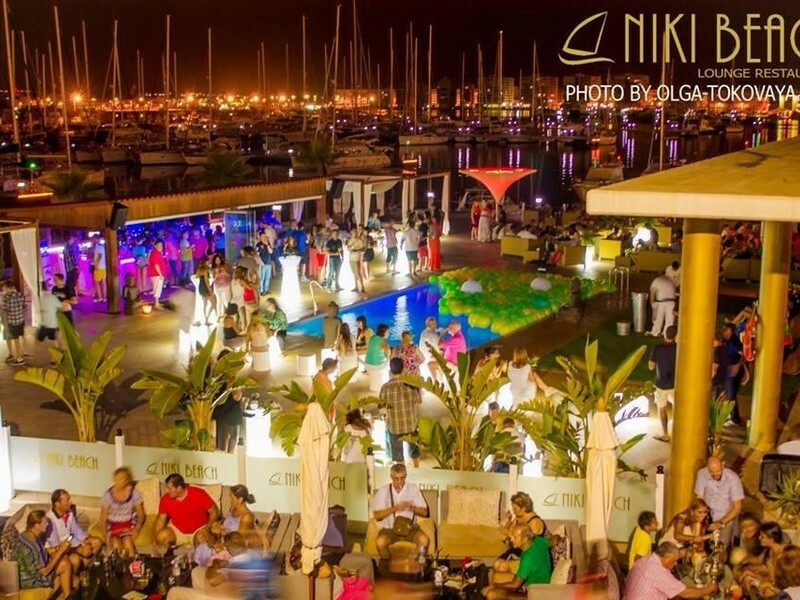 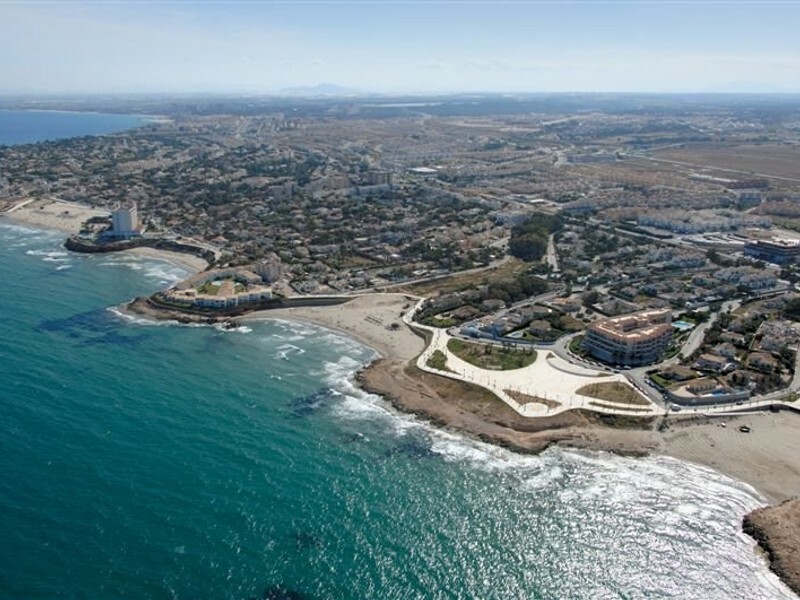 The Urbanisation is a short drive from two airports (Alicante and Murcia San Javier) both of which are well served with flights from a wide range of UK airports operated by many low-cost airlines. 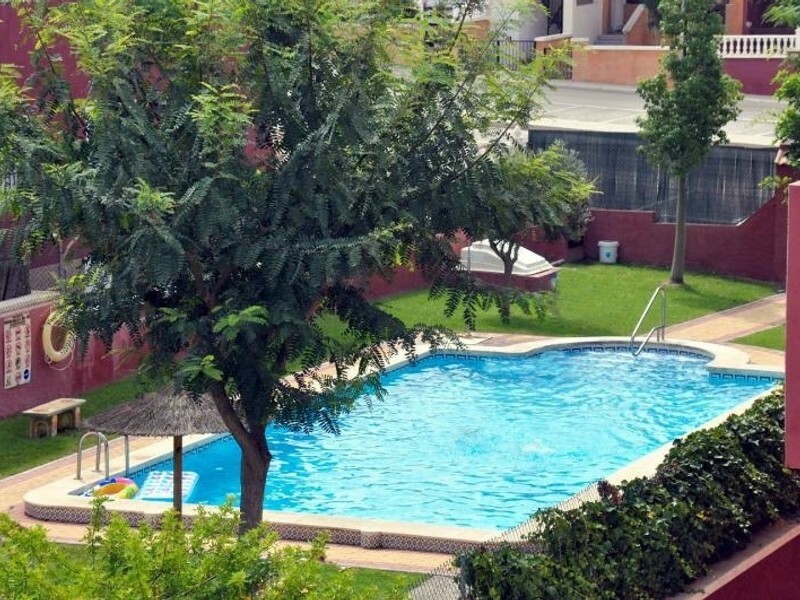 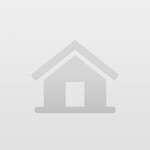 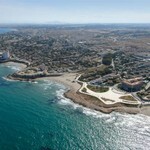 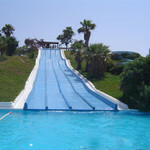 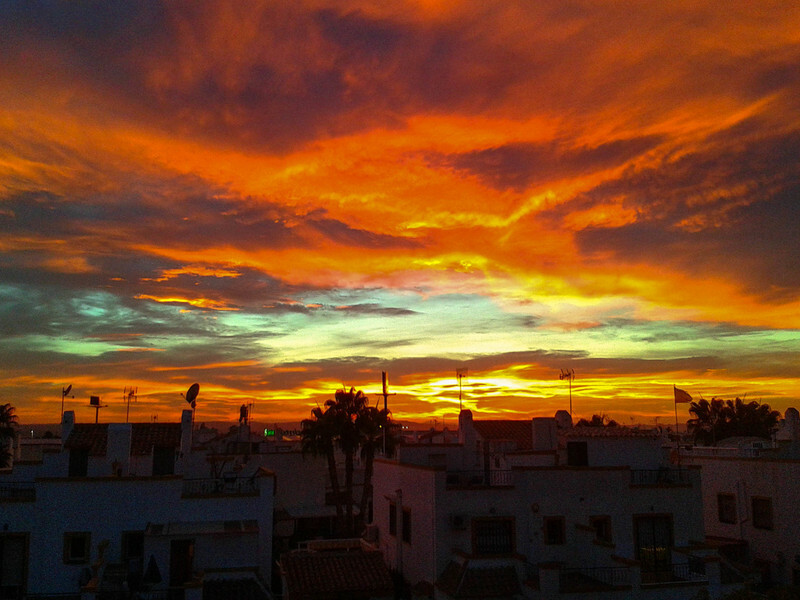 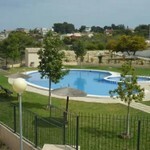 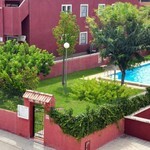 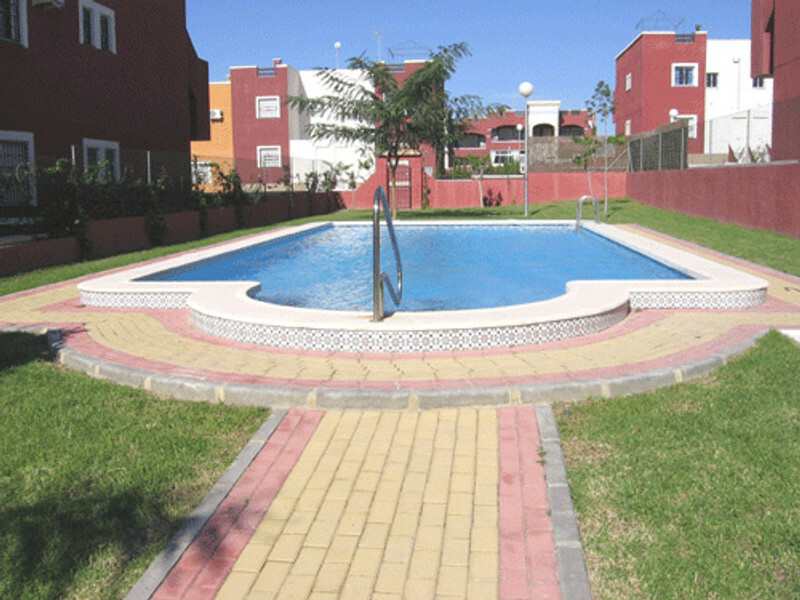 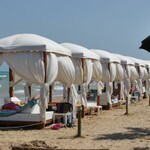 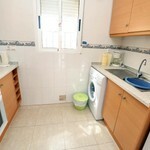 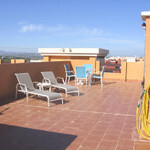 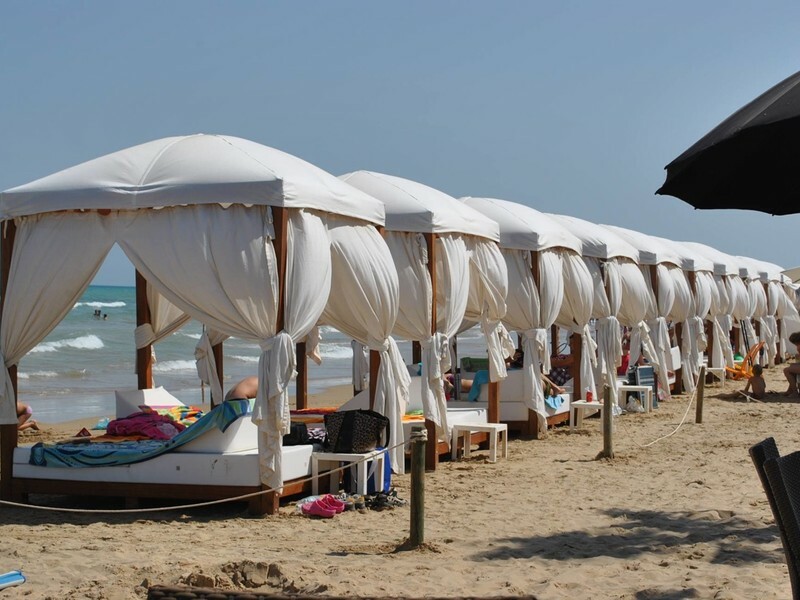 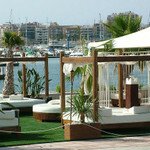 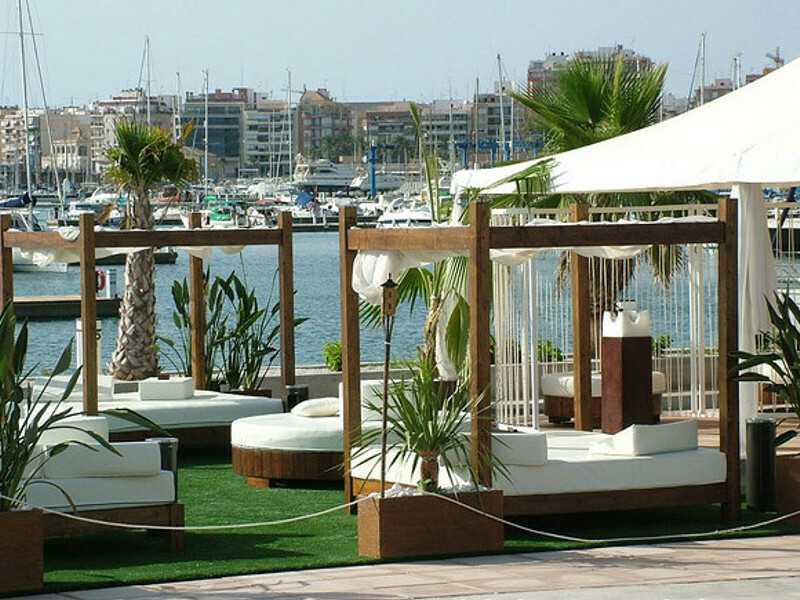 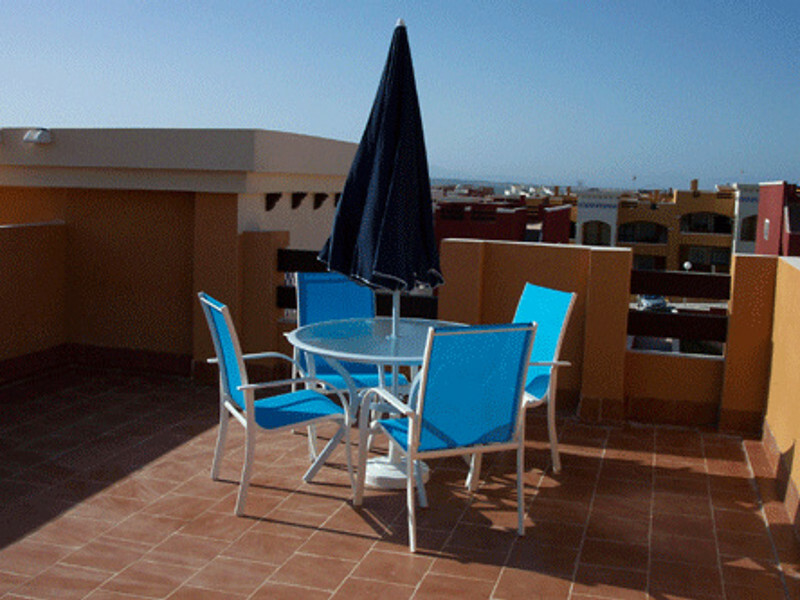 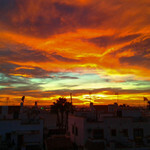 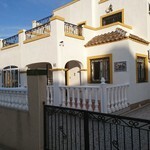 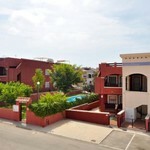 Los Altos is situated 5Km south of Torrevieja on the Orihuela Costa in the Costa Blanca.